The XCR3128 CPLD (Complex Programmable Logic Device) is the third in a family of CoolRunner CPLDs from Xilinx. These devices combine high speed and zero power in a 128 macrocell CPLD With the FZP design technique, the XCR3128 offers true pin-to-pin speeds of 10 ns, while simultaneously delivering power that is less than 100 A at standby without the need for turbo-bits or other power-down schemes. By replacing conventional sense Amplifier methods for implementing product terms (a tech- nique that has been used in PLDs since the bipolar era) with a cascaded chain of pure CMOS Gates the dynamic power is also substantially lower than any competing CPLD These devices are the first TotalCMOS PLDs, as they use both a CMOS process technology and the pat- ented full CMOS FZP design technique. For 5V applica- tions, Xilinx also offers the high speed XCR5128 CPLD that offers these features in a full 5V implementation. By Xilinx Corp. 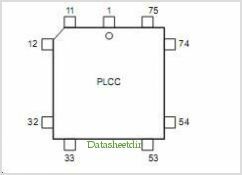 This is one package pinout of XCR3128,If you need more pinouts please download XCR3128's pdf datasheet. XCR3128 circuits will be updated soon..., now you can download the pdf datasheet to check the circuits!